Many people are familiar with the basic principles of the well known book The Wisdom of Crowds. The principles have been outlined here in previous posts and the book is one I highly recommend from our book club list. For anyone unfamiliar with this work, the basic argument of the book is that a group that is diverse in opinion, independent and thus not swayed by each others views, decentralized to allow the use of any specialization and local knowledge, that can have their individual opinions aggregated to an average solution, can make a better choice or estimate than any of the individuals within the group can. An easy to understand example of this was demonstrated by finance professor Jack Treynor in his class, where he decided to put the classic contest of guessing the number of jelly beans in a jar to the test. 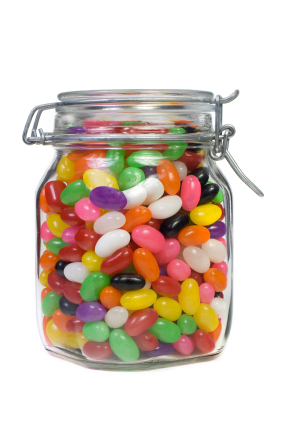 He showed that with a jar containing 850 jelly beans, that the average of the guesses of a group adhering to the conditions above estimated that there were 871 jelly beans in the jar. Only one person in the group made a better individual guess than the estimate of the group. It is ok that a particular individual outperforms the group. What is interesting is that if you do the test ten times with a different number of jelly beans in the jar, the same person will not consistently outperform the group with the exception of the outlier genius. So across multiple chances it is a very safe bet (the odds would be significantly in your favor) that the group outperforms any single individual in the group. How do these individuals make their guesses? Have you thought about this? Do they pick a low number because they are conservative and cautious not to overestimate? Go for a big number because they are risky and overconfident? Reasonably confident in some rational calculation regarding the spatial relationship between the jar and the beans? All of these kinds of guesses are likely, and to some degree governed by an emotional make up of the person making the guess – though I believe the emotional influences behind the strategy often go unnoticed. We just think we’re making our best guess. But what forms our best guess? So, these individual orientations are interesting and the resulting group dynamics when they come in conflict are fascinating. I recently had the pleasure to read the piece below written by Dr. Thomas Saaty, the architect and developer of the Analytic Hierarchy Process (AHP) for collaborative decision making. His methodology, the AHP, has become the most published form of decision analysis in the some 30 plus years since being introduced and has been applied to everything from the choosing the best place to live, to life and death decisions in palliative care. This recent writing from Dr. Saaty provides a very interesting insight on the nature of our judgments, and how our preferences are formed and contribute to those better answers from a group. Language is a descriptive approach of the world of experience and does not bring out the intensity of how we feel about things. It lacks the precision needed to represent those intensities and synthesize them in an effort to understand the diversity of feelings we have in response to the happenings around us. An important consequence of this limitation, language alone cannot be used to combine individual judgments into a representative group judgment about what happens in the world. It becomes necessary to have experts who use their own individual judgments to tell us what they think is the real answer. What if they are not as knowledgeable as we think they should be? At the risk of repetition, people have feelings with varying intensities and how strong these feelings are is very important to them. But language can deal with feelings with imprecise words that can only be roughly interpreted and rarely convey the implications of these feelings using deductive logic that relies on words to draw its conclusions. We need a way to capture the strengths of feelings of individuals and of groups of people and synthesize them accurately so we know better what the overall feeling is about different things they deal with which come together to shape their outlook. Once we learn to capture our feelings numerically in an accurate way, we no longer need to argue vehemently about how well we communicate our thinking and feeling. Sharing ideas is the most important approach to a valid outcome that corresponds to coping with reality to bring about what is in our best interest as individuals and groups seeking to fulfill our needs. Making comparisons is instinctive and fundamental in discovering what we think and how we feel about a complex issue. Not only humans are able to compare but living things like animals and plants also do. Of course some people have more experience with certain matters and need to be accorded greater influence for their judgments than those who may not have the practice and understanding. Dealing with intricate and elaborate issues this way is a new approach to complex problems involving great misunderstanding and conflict. Such an approach requires that we identify and structure all the important factors bearing on a problem. To do that we need to work creatively together to brainstorm and organize the structure of the complexity we face. All proposed factors and objectives must be included. Their importance will emerge from the process of comparisons and prioritization. Implementing such an approach itself needs a structure and priorities to discover the best agreed upon way to bring about the desired changes. I started reading and researching a bit more about these ideas to try to find similar concepts, and was intrigued by the work of psychologist Jean Piaget on Cognitive Development. He provides a description of how we move through stages to explore and interpret our environment and create meaning. This is an interesting field of study and relates closely to how we make decisions and the potential nature of biases. We’ll explore this more in the next post. In working with many organizations on a wide range of complex decisions, I never fail to be amazed at the reaction to this question; “What is the goal of this decision?, what are we trying to decide?” Almost invariably, the question seems as though it triggers a line of thinking that has not been explored before. The question is usually met initially with a bit of silence, then a moment of anxious glances exchanged around the room, and lastly a free wheeling groping for the answer. In defense of those who seem to be the hot seat on the receiving end of this question, it is an easy although risky thing to overlook. So how does something so central to decision making (what it is that is actually trying to be decided) get overlooked? Is it that so many casual decisions are made each day that we’ve come to believe it’s easy, and take this step for granted in our more complex deliberations? We shouldn’t assume that all decisions are created equal. Think about the tremendous levels of data collection and the amount of time spent by teams and individuals occupied with trying to inform these decisions. Given all this activity it seems something must be well enough defined to drive the action, so there may be something more at play. I’ve begun to believe that perhaps the objective isn’t so much being overlooked, but that people often immediately switch in to a mode of mind reading and trying to manage the group agreement without giving the group and opportunity to disagree in order to resolve their conflicts productively and find their points of agreement. As such, they are reluctant to say too much for fear of saying something that deviates from what may still be the unknown group norm or consensus. The idea is beautifully set out by Jerry B. Harvery in his article The Abilene Paradox: The Management of Agreement. Here is the short version of the paradox, you can read the more detailed discussion at the link above. What is so compelling to me about the Abilene paradox is that the entire chain of events can be undone by the simplest expression of transparency or personal preference by anyone involved (including the father in law making the suggestion to go to Abilene) that they are content where they are, doing what they are doing. This of course all points to, and highlights, several well know challenges in group decision making related to pluralistic ignorance, group think, and pseudo-consensus. When psychologist Irving Janis coined the term Groupthink in 1972, he identified eight symptoms of groupthink. Of the eight, these two seem to be most at play in the Abilene paradox. 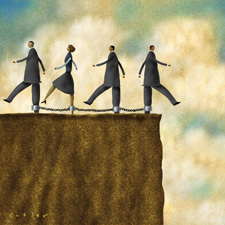 Self-censorship – Doubts and deviations from the perceived group consensus are not expressed. Illusion of unanimity – The majority view and judgments are assumed to be unanimous. These express themselves in a very distinct way in what is called pluralistic ignorance. The research on pluralistic ignorance is very interesting. When college students were asked about the high levels of alcohol consumption on campus it was found that most did not want to partake at such extreme levels but were all acting as if they did out of fear of rejection from other like minded people also feigning a desire to partake. But it seems no one can break the ice in these situations. There is actually a silent majority awaiting a leader to coalesce and provide an opportunity to express their true feelings and act in accordance with their preferences. Watch Dan Ariely present the topic below, it’s truly interesting and relevant. So taking all this into consideration, what if we could break through? Assign a facilitator: This is someone who has the role of challenging the group and asking the hard questions. It is best that the facilitator have a limited, or better no, stake in the decision outcome. They can read body language and draw out asymmetrical information and try to find those silent majorities if they exist. Bring in outside experts: These outsiders to the group can be brought in and asked for expert opinion and can be given the role of devil’s advocate by the facilitator. These experts can be positioned on the fringe of the group making them more inclined to disrupt the group norm and draw out differences. These can be carefully chosen rogue or maverick type experts who are empowered to express their ideas. The facilitator needs to support these experts and capitalize on the productive conflict they may generate. Use a decision process: Use a methodology like the Analytic Hierarchy Process (AHP) to anonymously source preferences and aggregate the group point of view. Allowing each individual to state their preference independently and then discussing this as a group can provide a mechanism for finding the points of disagreement that can ultimately become the conflicts that are resolved to create true consensus and agreement. Please offer your thoughts and insights about these issues, have you experienced any of these kinds of phenomena and how have you or your organization tried to resolve them? They’re biased? I knew it all along! I hope you like the title of this post. 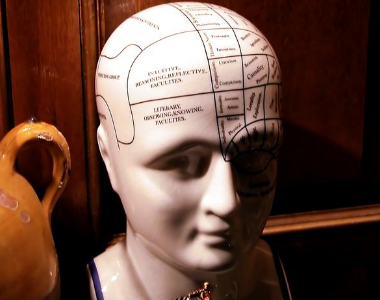 It tees things up pretty well for what follows in this first of a two part series on cognitive biases. The title demonstrates a Bias Blind Spot, suggesting the “I’m not biased, but THEY are”, and the famous “I knew it all along” type of thinking that accompanies the Hindsight Bias. I had an opportunity to speak on behalf of Decision Lens at the recent Cambridge Health Institute conference on Portfolio Management last month, and one of the parts of my talk that stimulated the most interest and conversation, was the portion on cognitive biases and how structured decision making may help overcome them. So, having had these conversations during and after the conference and given some thought to them in the context of portfolio decisions and project or product choices, I thought I would share a typical project selection type discussion that I have found myself in over the years and then break it down to look at what might be going on to help illustrate a few points. Next post we’ll talk about possible remedies of structured and collaborative decision making and their potential to positively influence the process. Enjoy. Setting: A product or project Steering Committee meeting in a large company delivering about 60% of its strategic planning goals from new product development (like many companies). Committee Chair: So we have a decision to make. Which of these two product options are we going to pursue? This is a critical strategic decision for us, and key to our ability to hit next year’s numbers. VP R&D (Joe): I think there’s not much to decide really, clearly WonderWidget is the superior option. Acme consulting’s report said as much, and Maria, didn’t your team’s study find it to be preferred? Director Market Research (Maria ): Well, I’m not sure how much value I put in Acme’s assessment, but yes, we did on the whole find WonderWidget the better choice. However, some groups preferred GreatGadget. In fact, look at these numbers. When I broke them out by age group against our target, an iron clad case can be made for GreatGadget. VP R&D (Joe): OK, but c’mon. We’ve tried the GreatGadget approach before, and it has failed outright. As I recall, the WonderWidget prototype shown to those groups didn’t even include our latest greatest improvements, isn’t that true Maria? VP R&D (Joe): I’m also not sure how we recruited those participants in the study, but they certainly didn’t seem representative of the typical savvy of most of our users, wouldn’t you agree Maria? Director Market Research (Maria): I have some concerns about a couple of aspects of the study design, that may have contributed to what you observed. VP Operations (Andre): Joe, there has to be considerable value in GreatGadget, it is right in our wheelhouse, it’s basically repurposing known technology! VP R&D (Joe): I wouldn’t say that… Are you saying that because of the common interface? VP Operations (Andre): We would have to be able to have GreatGadget commercially ready in a fraction of the time and cost!, 6 months max, and very little incremental investment based on our existing capabilities. VP R&D (Joe): It may be faster and cheaper Andre, but Maria’s right, no one wants it. We knew when we launched it that it may take a long time to work out the bugs. VP Operations (Andre): Maria, those are minor problems, we can overcome those from my shop. I’m 99% sure of it. Committee Chair: OK, I’ve been listening very objectively. We have a track record of not always being very good at these decisions. While we’ve been in a bit of a drought; we’re due for a win. It sounds to me like we are reaching a general consensus that we should pursue GreatGadget. So, how do we move forward? If you need to reference the biases discussed below, you can follow this link or those embedded in the discussion. Comment >> Our committee chair leads out of the gate to trigger the Framing Effect, immediately limiting the options to two. Then throws in a dash of Focusing Effect, and Hyperbolic Discounting to drive the group to viewing the decision through the filter of next year’s number. Comment >> Joe responds with what could be Positive Outcome, Wishful Thinking and Optimism bias inferring a foregone conclusion about the route to successful decision. He then evokes the Interloper Effect about the objectivity of the consultants with no substantiation, and pursues the Confirmation Bias as he seeks corroboration for his position from Maria. Comment >> Maria counters Joe’s Interloper Effect with a dose of Ingroup Bias rewarding her group for their superior research efforts, she then seems to have an episode of the Framing Effect as she begins to parse the data in ways to support an argument that runs contrary to Joe’s position. Comment >> Whoa! Maria hits Joe right in his Semmelweis Reflex as he responds to reject the new evidence that contradicts his position, he reels and strikes back with a combination of the Subjective Validation, The Primacy Effect, and Negativity Bias as he doesn’t substantiate the outright failure, gives the initial failure more emphasis than the current research, and gives more weight to the negative aspects of the previous effort, than any positives. He then slips in an uppercut that tags Maria right in the Suggestibility Bias. Comment >> Maria is now suffering from some combination of False Memory, and Cryptomnesia as she fights her confusion to sort facts from suggestions and is likely moving down the path to some form of Information Bias to try to shore up the data to make the case when the data is either unavailable or irrelevant to the influence driven argument. Comment >> Joe doubles down on triggering Maria’s Suggestibility Bias with his Fundamental Attribution Error about the participants in the study. Comment >> Maria hints at the fact that she may be concerned about a variety biases, like the Hawthorne Effect, Herd Instinct, Expectation Bias, or Selection Biases to which studies may be prone. Comment>> Andre is new to the party, and comes with a BYOB (Bring Your Own Bias) of Status Quo, and the Mere Exposure Effect. Comment>> Andre goes on to fall victim to the Planning Fallacy, by likely underestimating the time and cost required to undertake this similar but entirely new effort. He is likely in the throes of the Overconfidence Bias. Comment>> Joe makes a huge leap, and by way of the Authority Bias he attributes expertise to Maria and exaggerates her position through a bit of Egocentric Bias, and the Availability Cascade bias (a.k.a; if you say it enough it is true). Then he pulls out the Hindsight Bias! Comment>> ?? ?… Overconfidence Bias run amuck. Comment>> Lastly, this is a mix of Bias Blindspot (believing you are not biased), Outcome Bias (judging the result rather than the quality of the decision at the time, i.e. knowing what you knew then), and the Gambler’s Fallacy that biases one to think that a series of losses must be leading to a win, while the odds in the meantime remain exactly the same… all with a False Consensus Effect cherry on top. Sound familiar? In my next post I’ll talk about how to use a structured approach to decision making to help neutralize some of these effects and increase the chances that the group makes the best decision possible with the information available. “Argh-Ughhh (or other guttural utterances) Are you freakin’ kidding me? !, how in the world do I answer this question!?? I mean c’mon, we’ve all seen Back to the Future or Bill and Ted’s Excellent Adventure, right? Who do I look like Doc Brown? Oh wait, where’s my Flux Capacitor? let me get the DeLorean and I’ll tell you… or we can wait a few months and we’ll get Sherman and Peabody, and hop in the Wayback machine and do a post morten. I mean, what are we talking about? ?, are you worried about Godwin’s Law of Time Travel in the present moment? Do you want me to tell you if you’re Eckles stepping on a butterfly in Bradbury’s, “A Sound of Thunder“? I mean, really! Alternate futures and contradictory pasts!? You want me to solve that riddle!!?? Never mind the 19 social, 8 memory, 42 decision making and 35 probability biases that slightly complicate your question!! !…OK, breathe, snap out of it, SNAP OUT OF IT! All kidding aside, it’s a challenging question. Let me illustrate why by way of an example. Take the example of a company working to implement a collaborative, process based, decision making methodology back in 2005. The members of the Board want to make better strategic decisions about which product development efforts to allocate funding to in their business planning process. The agreed measure of portfolio value is based on a third year in market revenue projection for the proposed products. The company has approximately a 12-18 month expected project cycle time to get new products to market. That means the potential value created by those decisions in 2005 should be coming to fruition, oh, just about now! (Summer 2005 + 18 months development and launch + 3 year market penetration = ~2010). So this is why I struggle with the question of how to show the “value” for improved decision making after a 3-6 month process change effort. Not only that, but as time elapses post-decision, we usually find ourselves and our world in a very different place than the one we imagined. Sometimes most (nearly all) of the members of that board will have moved on to other professional opportunities. The economy has been interesting, I hope they made good choices. Neither of these things were remote considerations in the 2005 decision process. This can’t help but remind me of the wisdom of the old story about the civil war farmer and his son. Believe me, I understand the angst in our decision making, and experience it all the time myself. Sometimes those snap decisions that shape the moment have a shorter feedback loop, but many of our decisions have this “good decision, bad decision, too soon to tell” element to them. How about the family that was planning to move into their dream house in two days, only to have it consumed in fire while they wait. How many scenarios can you think of where decisions could have been made that would have swung their occupancy date 48 hours sooner only to have them present when the fire broke out? How about the numerous stories of people making decisions to cancel a flight to find that they somehow avoided an ill fated journey? Nothing makes the message of our parable above clear more than the story of the woman who missed a tragic flight, only to be killed in a car crash a day later. Good luck, bad luck, too soon to tell. If you think about this stuff too much, it could make you mental. So what was that question again? Oh yeah, here is what I think. Not I, nor anyone else can tell you if you are making better decisions, that’s too loaded a question and may be overrated anyway. What we can do is ask ourselves what makes us uncomfortable about the run up to making decisions and how can we mitigate some of those factors. Do I believe I/we have grown in our understanding of the issues?, and are they structured and/or organized in a way that helps me understand my priorities and values in this context? Has the amount of asymmetric information been reduced? If the answer is “no” (watch out), and if the process approach you are considering moves you closer to “yes”, then it is immensely valuable. Do I believe the decision process is transparent enough and provides a means of incentivizing those advising and consulting or providing options to be open, candid and forthcoming about the stakes and their motivations? If the answer is “no” (it’s a problem) anything you can do that moves you along the continuum toward “yes” is hugely valuable. Do I believe the process of getting to the decision has engendered commitment from those impacted by or essential to following the decided course of action? Have we disarmed the pocket veto and passive aggressive behavior because voices were heard and the issues were drawn out and confronted head on? If the answer is “no” (Danger), anything in a proposed process that moves you toward answering “yes” is immeasurably valuable. I suggest using a survey technique posing questions related to these measures to establish a baseline of shared understanding, reciprocal trust and levels of commitment. Take a risk on a process that you believe can move the needle toward more positive measures against this baseline. If you do, you have made a very big difference in the process of getting to that jumping off point where we are all unfortunately required to let events unfold – good decision, bad decision, it’s too soon to tell. It’s worth the risk, and it may turn out better than you think – especially given that hindsight bias is so insidious. Please share any thought you might have on measuring good decision making, it’s a fascinating topic. I want to talk about a few interesting aspects of decision making that struck me throughout the tournament, not all directly related to futbol. First, the technology controversy. Take a look at the video montage to illustrate what had so many frazzled about the real time decision making of the refs. There is probably no more pronounced case than with the first clip of the disallowed goal in the England v. Germany game, though many believe Karma may have been the culprit. No matter which technology is applied, at the end of the day a decision will have to be taken by a human being. This being the case, why remove the responsibility from the referee to give it to someone else? It’s an interesting perspective. At first glance it seems to suggest that whomever the decision maker, at whatever vantage point, in whichever time frame is subject to the same uncertainties and asymmetries of information to assess the decision. This is clearly not the case, just look at the video. Then, I started thinking maybe Mr. Blatter had a point? Reviewers are indeed subject to their own set of biases and perception issues. In some cases “going to the tape” can fail to resolve our doubts. In the most ambiguous cases this seems to have only furthered speculation and spurred new interpretation of the events no matter how many efforts are made to unravel the confusion and quiet the controversy. It’s important to recognize the different kinds of decisions, the snap decision, and those where we can take the luxury of process and deliberation. Both are necessary, and there are arguments for both the snap and deliberation. When time pressure constraints require us to make snap decisions, or when faced with a poorly described objective or poor information in deliberation, we are always prone to being misled by our judgment. Many of you may know the selective attention test. If you do I encourage you to watch it again and try again to achieve the objective. If you haven’t seen this before watch and enjoy. You have about a 50/50 chance of being very surprised. We need to apply judgment and carefully interpret our perceptions to make good decisions. So is it snap, or deliberate? I say YES. I find myself uncomfortable with the Sucker’s Choice that these debates often set up. It seems we’re often unwilling to wrestle with the more complex questions of how to combine such approaches, rather than choose between them. There seems to clearly be a role for “thin slicing” information to be used in the process of deliberation to avoid analysis paralysis. So, there is drama in decision making. When it comes to futbol, many argue that this may fuel interest in the game. It makes it more than a sport about the pure superiority of one team over another and enters in elements of chance, destiny, triumph over adversity, and the risks of being toppled by fate. We seem to fight against this. Maybe it hits too close to home. So when fans of a sport say leave it alone, maybe they recognize something. Maybe they recognize that our decisions are riddled with uncertainty and aren’t perfect, and very likely and simply cannot be. We can only work to reach that threshold of certainty that lets us act, and we have to find the means to efficiently and effectively decide given the circumstances, and then have the courage and character to deal with the consequences. The more we can come together and rely on each other to try to make sense of complex situations, recognizing technology as an extremely valuable ally (with imperfections) that we can partner with to better focus the picture or aggregate our judgment, we can often times improve our outcomes. Luckily, if all else fails there is a fall back. We can always submerge our options in an aquarium and drop in an Octopus to sort things out. It takes people to move crowds in the right direction, crowds by themselves just stand around and mutter. Everyone I’ve spoken to about this since reading this disagrees with him, so I guess he is right. Well… that’s kind of what you would have to conclude if he is correct to some extent, isn’t it? I think it’s interesting to look at the examples that were provided to justify this position, and without opening a political debate given their focus, it raises some interesting questions and a pretty compelling point regarding the nature of crowdsourcing. A willingness and commitment, to try in earnest through the crowd interaction, to make a decision, solve a problem or achieve a goal through compromise for mutual benefit . I think compromise may be an additional corollary to the four conditions of wise crowds when it comes to some aspects of social media. Stubborn “my way or the highway” opposition needs to be reserved for very special and very rare cases, and can’t be the norm. There needs to be some kind of appropriate motivation or incentive to participate in earnest, otherwise the divisive power driven arguments that are aimed at silencing people of differing opinions, will likely result in crowds that are quite irrational. When the purpose of engaging in a discussion in a social media forum is to score points, intentionally obfuscate another’s position at any cost, be decidedly closed off to anything someone of another affiliation than your own offers, or just plain be mean, the crowd will be cynical and not engaged in trying to achieve a compromise, but rather squared off to win at any cost! In these cases the inability to extract wisdom from a group might be attributed more to a victory of foolish individuals than a failure of wise crowds. In most of the examples in “The Wisdom of Crowds”, participants either had a self interest in getting the right answer, or were working as part of a group against a well defined goal. I’m not at all convinced this can’t be the result of emergent leadership within a group that builds this alignment and solicits input toward a goal. Designing diversity into a conversation and being open and accepting of what it brings to the process of drawing out the wisdom in the crowd certainly fits the definition of leadership. If however the suggestion is that there a few wise individuals, smarter than the rest, that need to edit inputs and tell the “muttering” crowds what to do because they don’t know what’s good for them, then that’s another matter. The semantics of the post are interesting and can be interpreted a few ways, my initial take was that the comments were a bit condescending. Curious what others think. Feel free to mutter, and I’ll try to limit editing. Being a strategist, I have a fascination with chess, or at least the ideas of chess. It conjures images of fierce competition, intellectual rigor, intense strategic thinking and steely eyed focus. It can also be surprisingly dramatic and controversial, with colorful characters. I really want to be able to play well. I can beat my six year old son fairly handily, his brain is not yet fully developed, so this should give you some insight into my skill level. I have several iPhone apps that are fun and instructive and provide a useful distraction and brain exercise to combat the monotony of tarmacs and airports. I like to see me and my iPhone as my personal rendition of the legendary competition between undisputed World Chess Champion Garry Kasparov and IBM’s Deep Blue Chess computer, except in my melodrama the opponents both have less capacity and the skill gap is greater and skewed to the machine. My level of pure frustration with chess is very much on par with what my friends who play golf describe as their emotional relationship to that sport. One good move or a flash of insight keeps me coming back to the chessboard like a good approach shot does them to the fairway. Garry Kasparov is considered by many (especially in the post Fischer era) to be the greatest chess player in the world. He wrote an interesting book called ﻿”How Life Imitates Chess”, which in the end is very much a book about… decision making. Some of my own progress as a chess novice has been stunted by analysis paralysis. Determining options can be daunting, choosing which to pursue can be even more so. After only three moves the number of possible positions on the board can be well over 60,000. So how do we decide? If this were a purely analytical process based on logic and analysis, it seems that when Garry Kasparov faced IBM’s Deep Blue computer in 1996 and 1997 that the ability of the computer to win these matches should have been a foregone conclusion as it is when I compete against my iPhone. Yet Kasparov won the 1996 match 4-2, he lost the 1997 rematch narrowly 2-1/2 – 3-1/2. He offered to play a third match during an appearance on Larry King Live with a number of conditions, including a willingness to concede Deep Blue as world champion if it won the match. IBM chose not to take him up on the offer despite the computer’s ability to calculate 200,000,000 positions on the board per second! So, how does Deep Blue Work? There are four basic chess values that Deep Blue must consider before deciding on a move. They are material, position, King safety and tempo. Material is easy. The rule of thumb is that if a pawn is considered to be worth a value of 1, pieces (knights and bishops) are worth 3 each, a rook is worth 5, and the Queen 9. The King, of course, is beyond value, since his loss means the end of the game. This varies slightly in certain situations — retaining the Bishop pair in the end game generally increases their value beyond 6, for example – but the laws of material are fairly constant. Position is more complex. In the old days, it was thought that control of the center was all that mattered. Nearly all grandmaster games before the 20th century began with Pawn to King 4 or Pawn to Queen 4. Control of the center is still important, but certain grandmasters in this century found some effective “hypermodern” openings that delay development of the center, with the idea that the opponent will overextend his position and leave himself vulnerable for attack. The simplest way to understand position is by looking at your pieces and counting the number of safe squares that they can attack. The more squares they control, the stronger the position. Thus, a seemingly quiet pawn move can be very strong if it opens many new squares for a more powerful piece behind it. The defensive aspect of position is the safety of the King. This is self-explanatory. A computer must assign a value to the safety of the King’s position in order to know how to make a purely defensive move. Tempo is related to position but focuses on the race to develop control of the board. A player is said to “lose a tempo” if he dillydallies while the opponent is making more productive advances. The programmers have defined how Deep Blue’s program evaluates these factors. The computer then searches through all the legal moves and chooses the one that yields the highest value. I don’t know about you, but this process is beyond my computational capacity in any meaningful and constrained time frame. So let’s think about this. It’s been estimated that through a process of elimination and prioritization of high potential moves, that human chess masters consider approximately three dozen serious options or so before making a move versus two hundred million per second by Deep Blue. Then, we apply a mix of analysis, judgment, preference, creativity, experience, intuition and a dash of guts to form a decision cocktail and make a choice (or sometimes take a gamble), often resulting in a very good outcomes. So, How do Garry Kasparovs work? So is this yet another tale of man versus machine, like the folklore of John Henry versus the steam hammer? Is it better to have nearly limitless computational capacity with limited experience and intuition, or vast experience and intuition and less computational capacity? It seems to me that a Deep Blue Kasparov would be invincible. Maybe man versus machine is the wrong question?